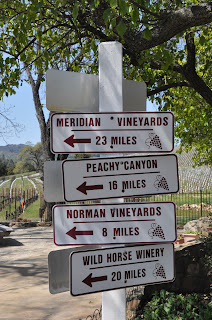 The Lush Chef's parents came into town over the Easter holidays and we typically hit up Santa Ynez for a day of wine tasting. 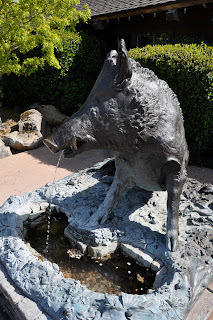 This time, we decided to do two days so we could take in more wineries and venture up to Paso Robles, which none of us had been to. We always start off with Fess Parker because I'm a wine club member and they have that awesome patio for picnic lunches. They were quite generous (as always) with their pours and selection of wines to try. After wolfing down my signature wine country sandwiches—tomato, basil, mozzarella and some sea salt on ciabatta bread—we ventured over to Pali Wine Company in Lompoc. I had met their winemaker, Aaron Walker, a couple of months ago with a friend in LA and took him up on his offer to visit. They're located in an airport hanger and have a great boutique operation. Aaron gave us a tour of the facilities and told us all about their wines. They're mostly known for their Pinot Noirs, but also make Chardonnay, Grenache Blanc and Rosé. 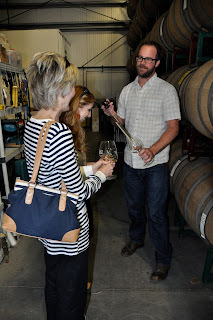 We got to taste some Chardonnay straight out of the barrel, which I've never done before. We tried it at 3 different ages, and there was a noticeable difference and cool to see how the wine tasted at different levels of the aging process. After the tour, Aaron had us try five different wines, and I ended up buying their 2009 Huntington Pinot Noir and the 2008 "Highlands" Red Wine, which is a blend of Merlot, Cabernet Franc and Cabernet Sauvignon. All of their wines are reasonably priced and delicious to boot, so I highly recommend stopping by. Our dinner reservation wasn't until 7:30 and we needed a little food in us to soak up all the wine. At Aaron's recommendation, we hit up Avant Tapas & Wine in Buellton. I never would have found this place if it wasn't for a recommendation. It's kind of hidden along Industrial Way at the end of the street, but it has beautiful views of the mountains. They have an excellent selection of hot and cold tapas, as well as entrees and an enomatic wine dispenser. During happy hour, the wine pours are half off (so much for not having more wine! ), so the Lush Chef and her papa each tried a few small tastes to go along with some bacon wrapped dates with goat cheese, a balsamic reduction and basil oil (it's called Yuppie Crack) and a cheese plate. We then hit the road for dinner at Cold Spring Tavern, which is on Stagecoach Road just off of Highway 154. I had stumbled across the place with my girl friends the last time we were in the area. We went into the bar and it was packed with people dancing and eating chili at the bar and a slew of motorcycles outside (it's apparently popular amongst the biker set despite the "romantic" setting). Unfortunately, the wait for dinner located in another building was going to be a long wait, so we vowed to come back. Their dinner menu is all steak and wild game and the sides of soup, salad, bread, mashed potatoes and veggies are significant. I could only eat half of my rabbit medallions because there was so much food on the table. It was just what we needed after a long day of wine tasting, and the setting was so rustic, relaxing and beautiful. I'm definitely going back on a weekend when they bust out the outside grills for tri-tip sandwiches. We spent the night in Solvang at Hadsten House, which is right along the main street by all the shopping. 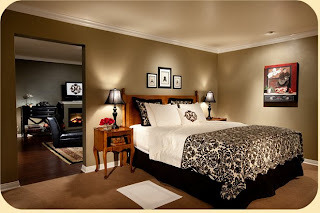 Rooms go for about $160 a night, but if you show up without a reservation and they have space available, you can get a room for $100. They recently updated the place, so all the rooms were spiffy, new, comfortable and clean and the hotel includes free internet and a complimentary breakfast. I didn't get a chance to check out the outdoor whirlpool, indoor heated pool or the spa, but there's always another time for that. It was the perfect place for us to rest up and get ready for the drive north early the next day. When I was polling my friends about wineries to try in Paso Robles, everyone said we had to go to Justin Winery. It's way up northwest on Chimney Rock Road, just off of Vineyard Drive, but the journey was a beautiful one, so we didn't mind. I would have been happy just walking and driving around through the valleys and amongst the trees all day long, but we had wines to taste! A vineyard and wine cave tour, plus a tasting is $15 a person, which we all did. Next stop was Tablas Creek, which is on Adelaida Road heading back south on Vineyard Drive. I had been told by an oenophile that "they make some serious juice," so we were excited to try the place. They have a nice tasting room set-up with multiple tables and pourers so you don't feel like you're crammed in with everyone. They specialize in wines made from grapes descending from France's Rhone Valley. They bring vines directly over from there and our pourer told us how they were waiting on some vines to get out of a three-year quarantine at a nearby university—a process all foreign vines must go through when coming to the US. Tastings are fairly priced, you keep the glass and you get your fee back if you buy a bottle of wine. The tasting menu gives one a lot of wines to taste and our pourer was also generous and brought out a couple of wines that weren't on the menu. She let me try a few for a second time because I just couldn't decide which one to buy! All of their wines are reasonably priced and I ended up purchasing their 2010 Patalin de Tablas—a blend of Syrah, Grenache, Mourvèdre and Counoise. We continued south and went to Opolo, which has spectacular views and a fun, easy-going tasting room. They do mostly reds there, which of course the Lush Chef and her papa love. Again, the tasting fees and wines were all a good price range, and I walked away with their 2010 Mountain Zinfandel. I also really loved their Tempranillos and Montagna Mares. After the tasting, we drove to the top of the hill where they have some picnic tables. We put out a spread of cheese and fruit and soaked in the spectacular vineyard views. I could have stayed all day on that same road, but we decided to venture east and see what that side of Paso Robles had to offer. Eberle was our next stop along Highway 46E, and Gary Eberle, the founder, is kind of considered the father of wine out in Paso Robles. He was one of the first to start making wine in the area and has been instrumental in raising awareness around the world about the wines the Central Coast has to offer. They also do wine cave tours here, but I preferred Justin's set-up. Tastings are free at this place, so if you're on a budget, it's a great place to stop by. I have to be honest, I didn't feel like any wines really stood out, but perhaps my palate was shot after downing a ton of wine all morning. There's a pretty outdoor deck with nice views and a long tasting menu, so worth a visit if you're on that side of town. We also made a brief stop to Le Vigne, which is just off of Airport Road along Buena Vista Drive. It's another great little spot to hit up for some free tastings, and they also do cheese pairings. I actually ended up preferring the northwestern part of Paso Robles because it just felt more serene at the tasting rooms. The wineries are a little bit more spread out, so you're not going to get a ton of those big touring buses up to that area and most folks stick to the main road. I'll definitely be back because there are so many more wineries to explore. I've heard of and done some bar-hopping, but winery-hopping is new to me. It sure looks worth a try though. 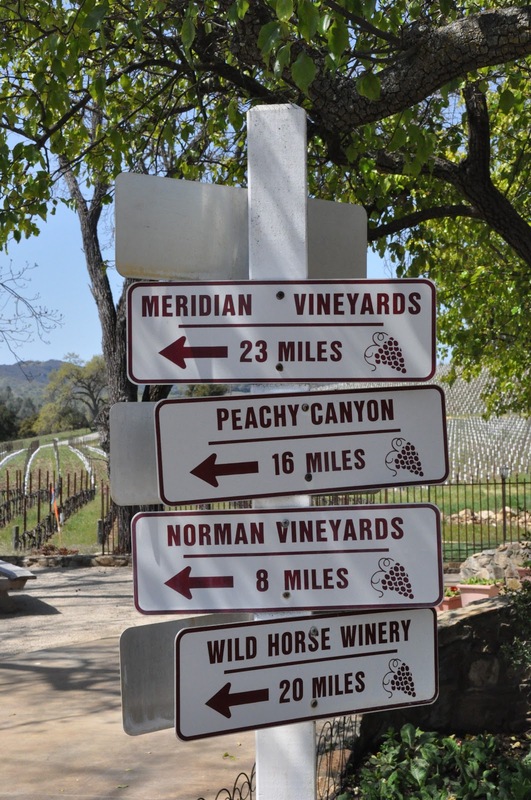 If you were to spend a night or two in this area, do you recommend Santa Ynez or Paso Robles? We may not have time for both. Thanks! @Tastes Alive - you really can't go wrong with either region. They're both beautiful areas with plenty of vineyards to explore, restaurants to eat and nice places to stay. its a great thing to test some unique wine from the fastest growing wine region paso robles .